Cercis chinensis 'Avondale' is an ideal choice for a very small garden tree. Flowering well in this climate despite its Chinese origin, many dense clusters of deep magenta pink to lilac purple, pea-like flowers form. The vibrant pink flowers adorn the bare branches in March-April, slightly earlier than other Cercis varieties and great for dispelling the winter grey. After the pleasing display of spring flowers, rich green, glossy round foliage emerges offering a great foil for other plants throughout the summer. The foliage turns shades of buttery yellow in the autumn for added interest. Cercis 'Avondale' is a small tree that can be grown in a large container for several years and, if pruned after flowering, will maintain a bushy and attractive rounded shape. 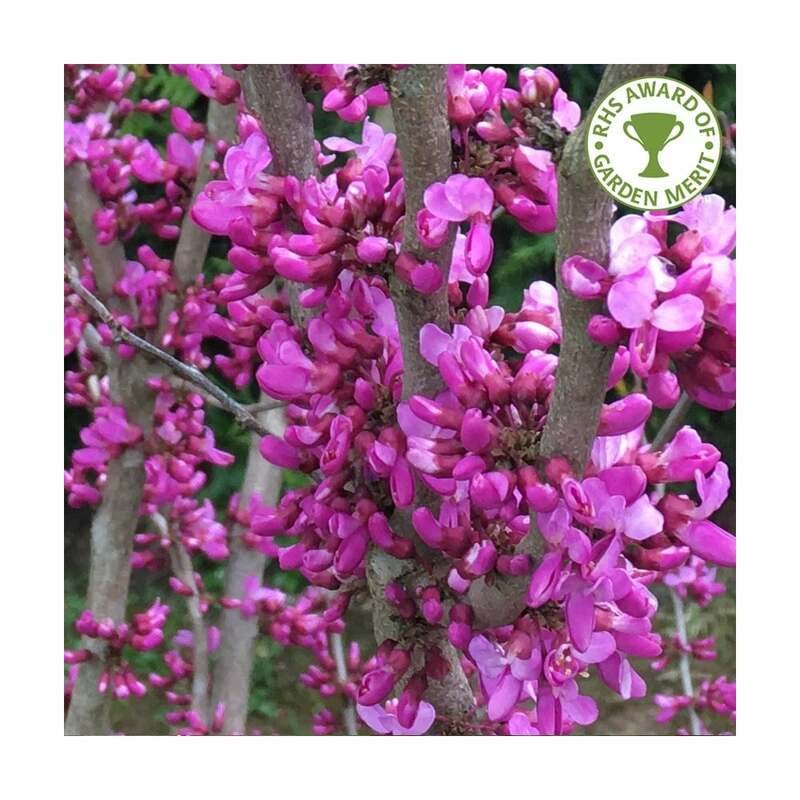 The Chinese Redbud will grow to just 2.5 x 2.5 metres in 20 years, making it the perfect small garden tree. Cercis 'Avondale' will thrive in most soils, including those which are dry or chalky and is reasonably drought tolerant once established. For maximum flowering, plant in an open sunny position where light levels are high. Our pot grown Cercis Avondale trees can be planted at any time of the year. Start by removing weeds and grass within a metre of your desired planting hole, that is ideally in a sunny location. Dig a square hole as deep as your root mass and approximately 2x as wide. To help the tree establish more effectively, sprinkle root grow in the hole. We recommend planting Chinese Redbud trees (not bush forms) with a stake and tie kit. For single stakes, place the stake at an angle to avoid penetrating the rootmass and knock it in until it is firm. Use a buckle tie, placing the spacer between the stake and tree. If you’re planting Chinese Redbud in spring or summer, water well for the first few months. Increase watering if there are extended periods of hot or dry weather. If planting in autumn, you may only need to water a little. Irrigation kits make it easier. Cercis Avondale tend to grow with multiple leaders rather than one clear leader. Allow this to occur naturally for the best overall shape. If your Chinese Redbud requires hard pruning, you can do this in spring/summer after flowering. Any general pruning to remove badly positioned or damaged branches should be carried out in winter.